Zea mays kernel fragment was recovered from a feature and directly dated. 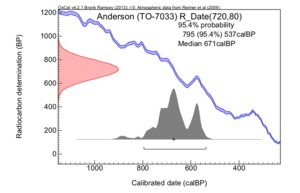 This date has been reported in the Canadian Archaeological Radiocarbon Database (CARD) (Morlan and Betts 1999). 2000 The Worked Faunal Material from the Anderson Site: A Uren Village on the Lower Grand River, Ontario. Ontario Archaeology 69:7-18. 1999-2005 Canadian Archaeological Radiocarbon Database. http://www.canadianarchaeology.ca/. Canadian Museum of Civilization, Gatineau, Quebec.